Are you up for an early adventure? Then a morning at Bukit Cinta should be included in your Bali itinerary. I managed to drag Ulrik out of bed at 5.45, which is no small feat. We jumped on our scooter and were met by the most stunning view of Mount Agung set against a pink sky. Mount Agung or Gunung Agung is an active volcano in Bali and also the highest point on the island. Standing tall at over 3000 meters, it dominates the surrounding landscape and influences the climate, especially the rainfall. 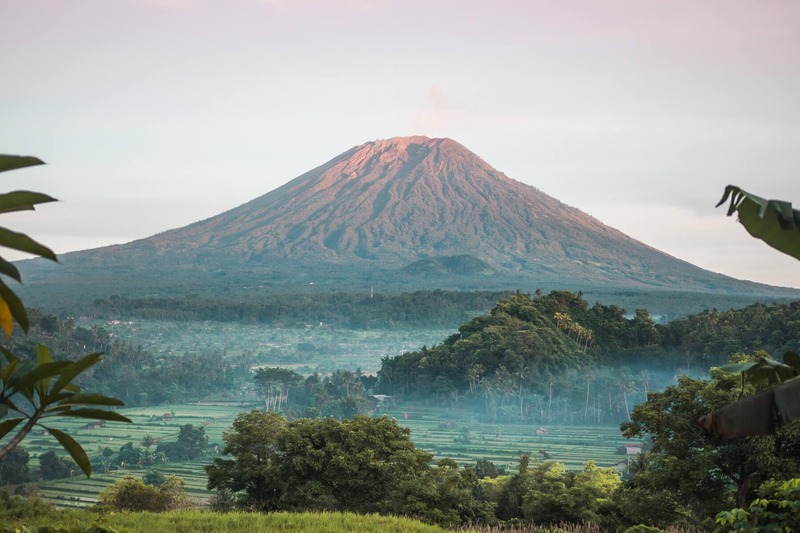 Balinese people believe that Mount Agung is a replica of Mount Meru, the sacred five-peaked mountain of Hindu, Jain, and Buddhist cosmology which is believed to be the central axis of the universe. In 1963, after having been dormant for almost 120 years, Mount Agung errupted. It was one of the largest and most devastating eruptions in Indonesia’s history, with lava flows, toxic gasses and mudslides killing over 1500 people. It was seen as a miracle and a sign from the gods that Pura Besakih also known as the Mother Temple, located high on the slopes of Mount Agung somehow managed to survive the explosive erruption. As many of you might have seen in the news, the volcano woke up once again in 2017 with five major erruptions resulting in the airport closing down and hundreds of thousands of people had to evacuate their homes. Agung has since had several smaller erruptions and is still today concidered to be in an active phase. Can you see the smoke coming from the volcano? We shot this at the upper viewpoint where you can stand just beside the road. Bukit Cinta is located in the Karangasem regency, east on the island. It’s not hard to find when using Google maps, just search for “Bukit Cinta Pangi” which will show you the location of the upper viewpoint. If you don’t have mobile internet remember to download the map before you go. 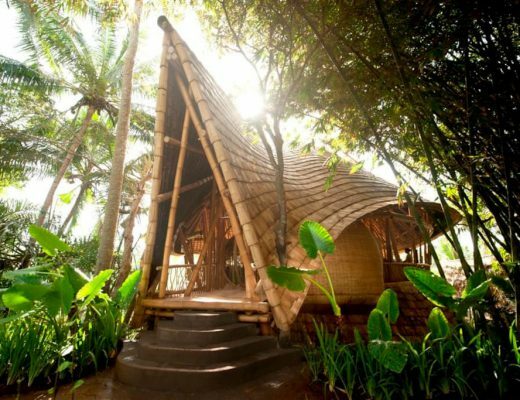 We decided to spend a few days in East Bali and booked one of the two bungalows at Kubu Carik. All I have to say is wow, what an incredible place. The photos on Agoda does not do this place justice at all! I don’t think I’ve ever experienced a better view from my accommodation anywhere. I’ll write in more detail about the hotel later because it truly deserves its own post. I decided prior to our trip that I had to see the stunning view of Mount Agung from Bukit Cinta this time. And to my surprise, it turned out the viewpoint is located only 3 minutes away from Kubu Carik which we had already booked. So we got to experience sunrise over Mount Agung two days in a row. Although I recommend spending some time in East Bali, most of you will probably be based out of Seminyak or Canggu. It is still very possible to rent a scooter and drive to Bukit Cinta by yourself. From Seminyak or Canggu, it will probably take around 2/2.5 hours. So if you want to get there for sunrise you should leave your accommodation around 4. There won’t be much traffic at that time so driving by yourself shouldn’t be too scary. But please only head out on long journeys like that if you feel confident driving a scooter. 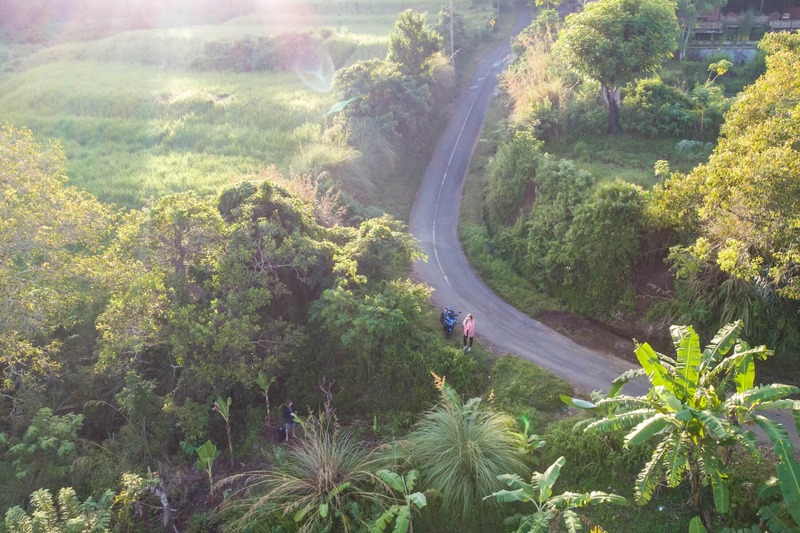 It’s not as simple as it may look and the roads in Bali are not always the greatest. 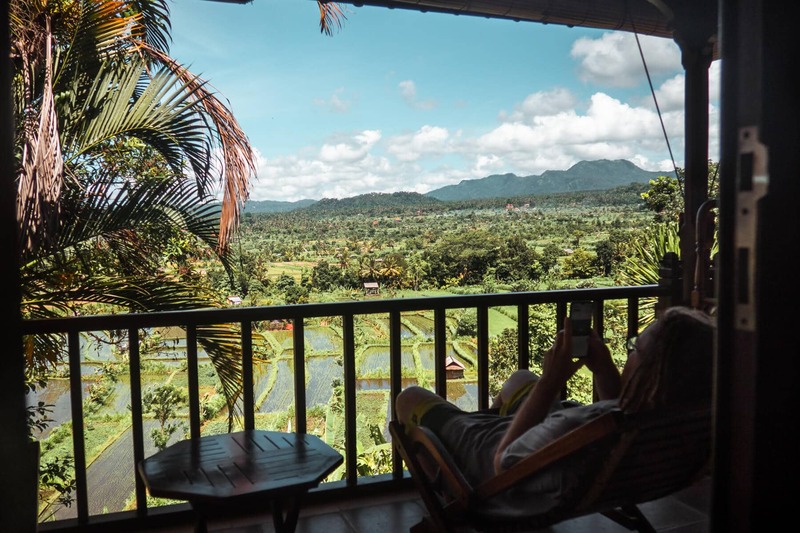 You can easily rent scooters in all the main tourist hubs throughout the island including Canggu, Seminyak, Legian, Denpasar, Ubud and the Bukit Peninsula. Most of the time you won’t even be asked to show your license. Scooter rental is 70k Rp ($5) per day in most places or you can get lucky and find a place that still rents them out for 50k like they used to. You can often get a great deal if you rent it on a monthly basis, anywhere between 800k Rp. – 1.2 mill Rp. ($60 – $85). Don’t be afraid to bargain in you’re renting it for a longer period of time. If you feel more comfortable going by car, it is possible to hire a driver for around 650k for the day. Most hotels will be more than happy to organize it for you. You’ll soon see that everyone in Bali knows either a driver or someone that rents out scooters. Often it is a cousin or a brother so you will always be covered no matter where you’re staying. 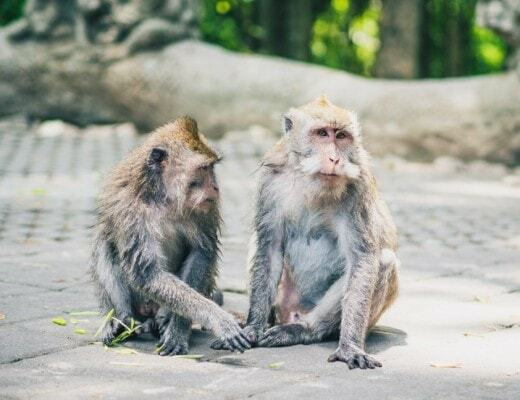 If you do decide to go to Bukit Cinta you could make a day of it and also visit some of East Bali’s other highlights such as Taman Ujung Water Palace and Pura Lempuyang. At Bukit Cinta, there are two great viewpoints where you can shoot photos among a typical Balinese scenery with Mount Agung as the backdrop. 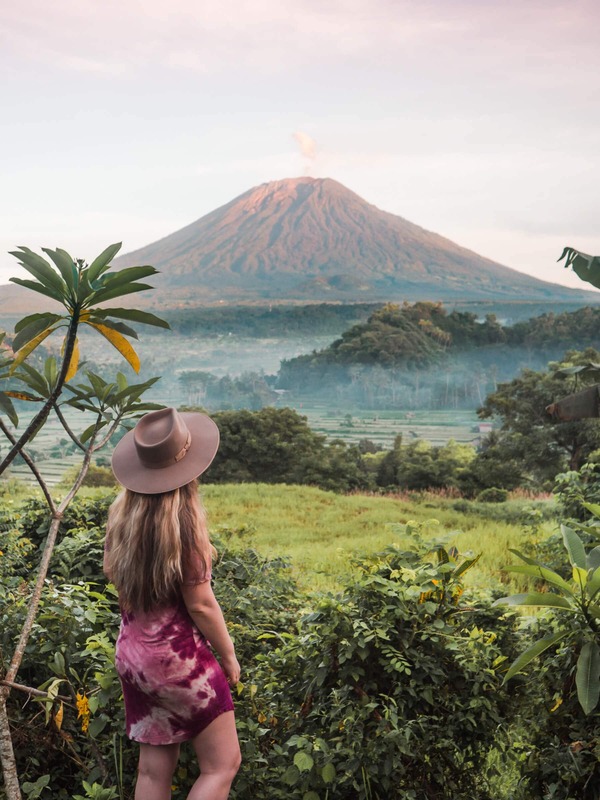 Of course, there are a lot of other places you can view the volcano as well, however, these two are in our eyes where you get the best view, especially for photos. If you do decide to stop somewhere else, remember to respect the local farmers and don’t walk in the rice fields without asking for permission. The photo above was shot at the lower viewpoint where you can walk down the hill. 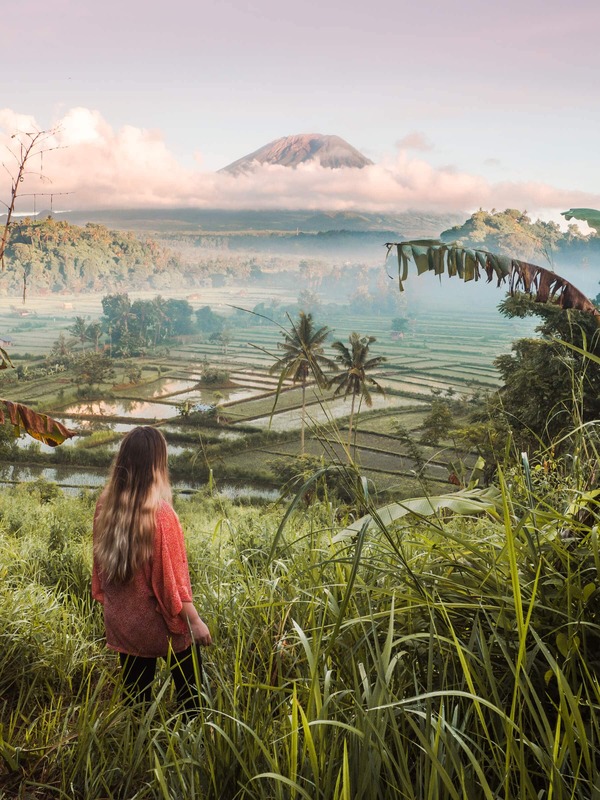 You’ll see two palm trees, a distant stretch of rice fields and the incredible Mount Agung standing tall in the horizon. There is room to park your motorbike just off the road as you can see below. I’m not a fan of creepy crawlies so I wore shoes and pants for this one. It was very wet and slippery so be careful and I would suggest making some noise to scare away whatever’s hiding in the tall grass. Just up the road, about 30 meters, you’ll find the second viewpoint. This is a bit more convenient as you’re able to shoot from the side of the road. However, if you want to be in the shot your photographer has to stand in the middle of the road, so be careful and listen out for cars and motorbikes. 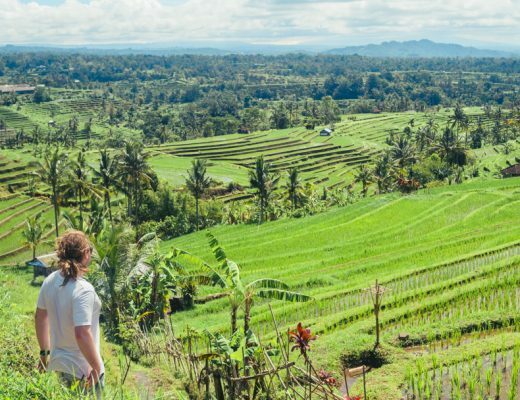 After you’re done marveling at the impressive sight of Mount Agung, take your time and explore the surrounding area. It’s stunning, so just riding your scooter around on the narrow streets is an experience in itself. Behind the scenes at the lower viewpoint. 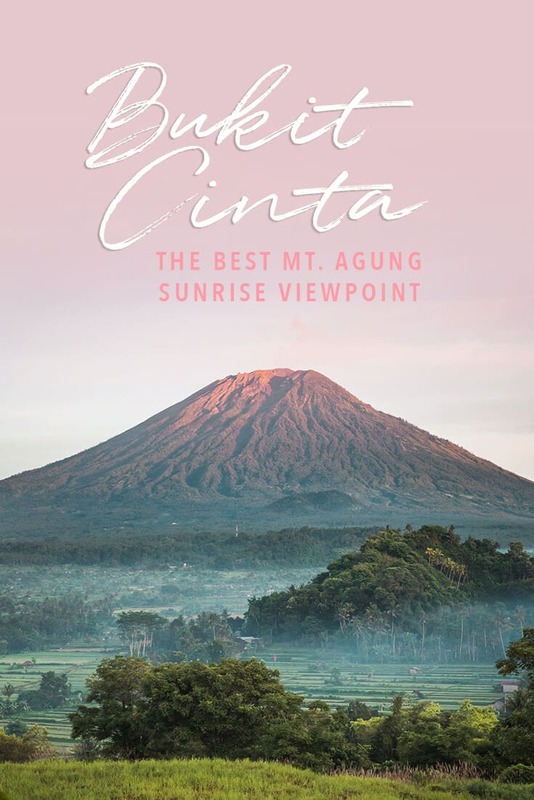 We already knew Bukit Cinta would be great for sunrise and since we were staying in East Bali we wanted to go and see it for sunset as well. However, as soon as the sun started going down the volcano disappeared into the clouds. You can, of course, see the beautiful view all day but for that moody look with fog on the rice fields and a pink sky, you should get there for sunrise around 6 am. Have you visited East Bali? Let me know in the comments!